All the police officers I spoke with were, if anything, extravagantly conscientious in the use, storage and disposal of information their drones had gathered. But the potential for mission creep and outright abuse is great. In September a report by the Congressional Research Service, titled "Drones in Domestic Surveillance Operations," came to the following non-conclusion: "the sheer sophistication of drone technology and the sensors they can carry may remove drones from [the] traditional Fourth Amendment framework." Well, that settles that. And that's just the government. Drones don't care who they work for. They'll spy for anyone, and as they get cheaper and more powerful and easier to use, access to military-grade surveillance technology will get easier too. Voracious as they are for information, drones could take a serious chunk out of Americans' already dwindling stock of personal privacy. It's certainly not legal to fly a drone up 10 stories to peer through the curtains into somebody's bedroom, but it's just as certain that somebody's going to do it, if they haven't already. Last February an animal-rights group in South Carolina launched a drone to watch a group of hunters on a pigeon shoot on private property. The hunters promptly shot it down. It might be America's first case of human-on-drone violence, but it won't be the last. Whatever happens on the civilian front, the ongoing dronification of the U.S. military is barreling ahead. The Predator has already been superseded by the larger, faster, more powerful Reaper, which is in turn looking nervously over its shoulder at the even larger, jet-powered Avenger, currently in the testing phase. The U.S.'s skunkworks are disgorging drones in a bizarre profusion  like Darwin's finches, they're evolving furiously to fill more and more operational niches and creating new ones as they go. Already soldiers carry hand-launchable Raven surveillance drones and kamikaze Switchblade drones for targeting snipers. The K-MAX unmanned helicopter ferries cargo around Afghanistan for the Marines. The Navy's SeaFox, a single-use underwater drone, is hunting for Iranian mines in the Persian Gulf. The Army is testing a Long Endurance Multi-Intelligence Vehicle, essentially a 300-ft.-long unmanned blimp designed to squat over a battlefield at high altitude for weeks at a time. (Its manufacturer, Northrop Grumman, promises "more than 21 days of unblinking stare.") DARPA has fielded a tiny drone that mimics the flight of a hummingbird, and it's mulling a network of deepwater drones that would dwell on the seafloor but  like Godzilla  rise to the surface in times of need. Drones are learning to think for themselves. Those University of Pennsylvania drones are already semiautonomous: you can toss a hoop in the air and they'll plot a trajectory and fly right through it. (Whether or not you count Google's self-driving cars as people-carrying, highway-borne drones seems like a question of semantics.) They're also gaining endurance. In June, Boeing tested a liquid-hydrogen-powered drone called the Phantom Eye that's designed to cruise at 65,000 ft. for four days at a time. Boeing's Solar Eagle, which has a 400-ft. wingspan, is scheduled for testing in 2014. Its flights will last for five years. This technology will inevitably flow from the military sphere into the civilian, and it's very hard to say what the consequences will be, except that they'll be unexpected. Drones will carry pizzas across towns and drugs across borders. They'll spot criminals on the run and naked celebrities in their homes. They'll get cheaper to buy and easier to use. 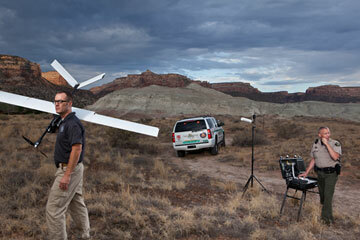 What will the country look like when anybody with $50 and an iPhone can run a surveillance drone? Last fall the law schools at Stanford and NYU issued a report, "Life Under Drones," which was based on 130 interviews with Pakistanis. It makes for unsettling reading. "Drones are always on my mind," said a man from Islamabad. "It makes it difficult to sleep. They are like a mosquito. Even when you don't see them, you can hear them. You know they are there." Right now the U.S. is the only nation that operates drones on a large scale, but that will change: flying drones is hard, but it's not that hard. Singer estimates that there are 76 other countries either developing drones or shopping for them; both Hizballah and Hamas have flown drones already. In November, a Massachusetts man was sentenced to 17 years for plotting to attack the Pentagon and the Capitol with remote-controlled planes. (The drone equivalent of the Newtown, Conn., atrocity is simply beyond contemplation.) The moral ambiguity of covert drone strikes will clarify itself very quickly if another country claims the right under international law to strike its enemies in the U.S. There may come a day when the U.S. bitterly regrets the precedents it has set. Americans are great and heedless adopters of new technologies, and few technologies are as seductive, promise so much at so little political and financial and human cost, as drones. They give us tremendous new powers, and they seem to ask very little of us in return. Obama captured the singular quality of drone warfare precisely in a remark that appears in Mark Bowden's recent book The Finish. "There's a remoteness to it," he said, "that makes it tempting to think that somehow we can, without any mess on our hands, solve vexing security problems." That illusion is just what makes drones such a challenge, especially as we introduce them into our own country. Drones don't just give us power, they tempt us to use it.